← This week Rosh HaShana, happy 5771! Us British and the French are probably the world leaders at it. French truck drivers block ferry ports every so often, I had a one day trip to Bayeaux messed up by truckers making Cherbourg traffic come to a standstill. The British did it a lot, quite often with the car industry, which probably made quality control in the 70s/80s with cars go awry sometimes. Usual thing: stick an oil drum out in the car park and dress up warm as its winter in some gloomy West Midlands factory estate and make a fire and have plenty of logs and banners and make as much fuss possible when you have a fall out with your employers. I am sure there are times where management does things which are unfair or take advantage of staff and something has to be done sometimes. But this week quite big surprise with Israel’s main Tel Aviv Ben Gurion airport on strike this week, over rows on pensions. This made me think of some things of late. Yeshua (Jesus) was a blue collar worker. He was a carpenter, I guess his pre-ministry secular work probably just consisted of a team of him and his step father Yosef. The scriptures don’t say much about his pre-ministry career which must of been between after Bar Mitzvah (13) until his was 30. Of course there was times he spent his teenage years in a synagogue preaching quite often. As my grandad was a carpenter, I think it would of been great to of been a fly on the wall at the carpentry shop and see what went on in early days. I would bet Yeshua would of been a good person to have around if there was some kind of industrial action. Rather when floor workers grumble about their bosses as making conversation in the staff lounge or on the way home, Yeshua was a man of substance in getting things done and resolving conflict. If Yosef’s carpentry Ltd was with a bunch of other chippies * and builders doing a contract for a major house build in Capernaum, and they thought their bosses were pulling a fast one *, Yeshua would be standing in between the middle of the picnic benches during a lunch time with the other workers not happy in a circle around, put his cup of tea on a table, and with pencil behind ear would of directed the workforce into praying for their employers, given advice to the whole team (and a quiet word to the bosses) over how to make work tolerable again. Being an Israeli, talking loud and waving your arms a bit helps getting attention. He would of shown kindness and empathy with those given the crushingly hard news of a redundancy. Yeshua was kind with those timid or not so popular. Like Zacchaeus whose short height gave him difficulty being able to see the Lord speaking had to climb a tree. See Luke 19 – 1:10 Christ told him to come forward in a gentle and encouraging way. He ate with tax collectors and sinners: – Matthew 9 : 11 The workers who awkwardly sit on their own in the corner of the cafeteria, not fitting in with the cliques of the more established teams, Yeshua went and had fellowship with. 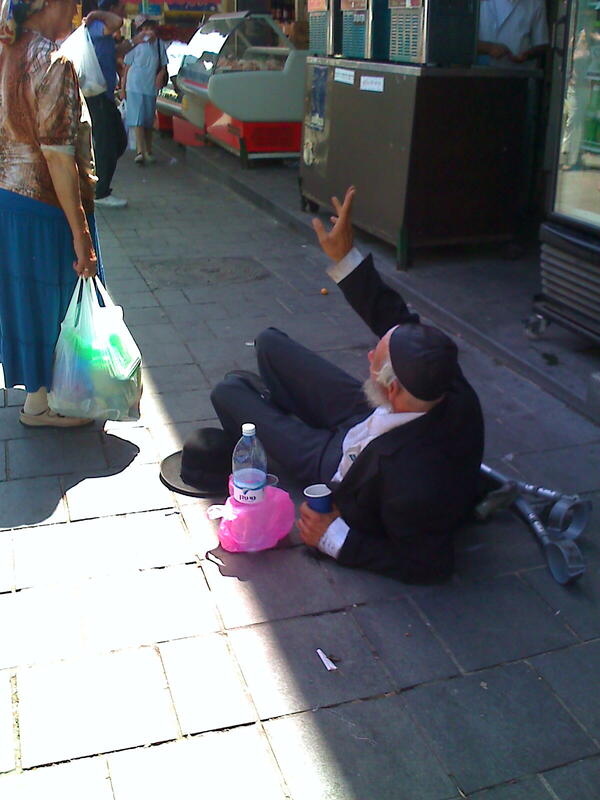 Incidentally: I see this gent often on crutches begging in the middle of the Shuk open market here in Jerusalem. He always makes me think of this verse. If Yosef’s carpentry shop Ltd didn’t get their invoices settled on time from the local municipality, because the woman who does the cheque writing was off on holiday and the management were too disorganised to have someone to sort it out in the interim, I think Yeshua would find away to politely get the payments paid pronto. He would of calmed down the factory floor and sorted out fall outs between the teams and no ‘them-and-us’ type shenanigans between the different ranks.